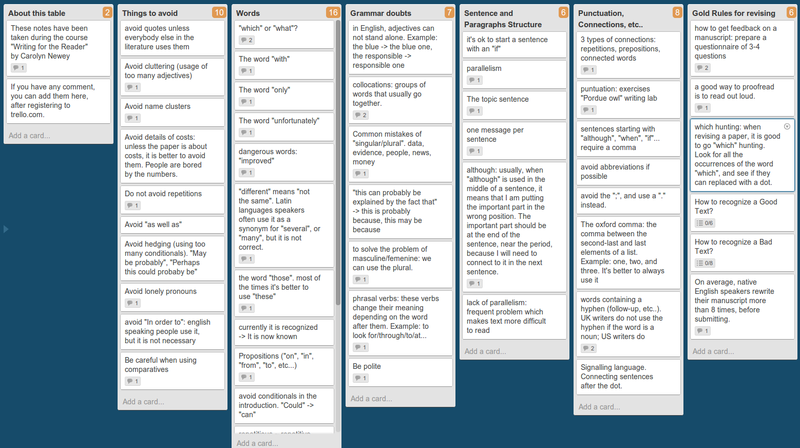 I recently took a course on improving English Writing skills for researchers. These are my notes, organized as a series of “Do and Do not” lists, plus some separate list for each section of a research paper. Feel free to have a look at them and make use of them. If you have any comments, you can add them here or to table. Have an happy paper writing day! click to access the notes. The “Phylogenetic Tree” for the “Semana de la Ciencia” in Barcelona. In the first five minutes, we had a short presentation explaining that we all come from a common ancestor, and that our work of evolutionary biologist is to reconstruct the tree of life. 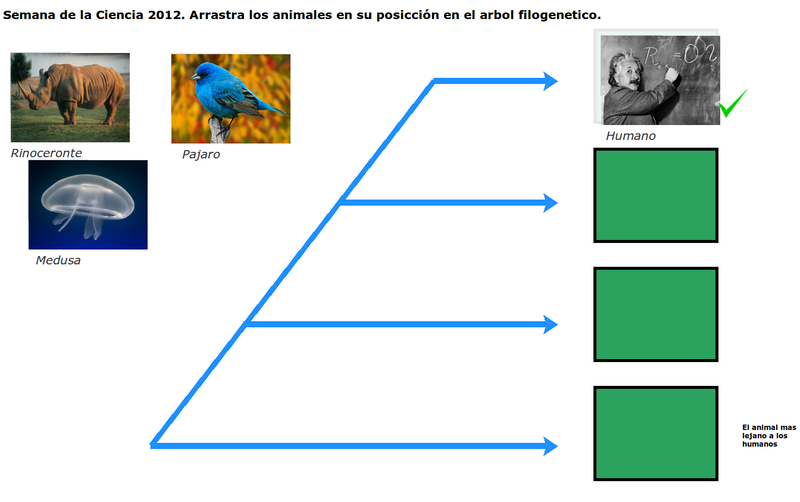 We also explained what a phylogenetic tree is, and how we reconstruct it. In the next three minutes, we played the first game. This game was quite easy, and was meant to check if the student understood how phylogenetic trees are constructed. During this first game, one volunteer student had to decide where to put a mammal, a bird and a jellyfish in a phylogenetic tree. In the next minutes, we played the second game, which was a bit of a trick. Students had to reconstruct the phylogenetic tree of four protists. Have a look at the “Juego 2: protists” to see it. This game was tricky because there it is no way to come with the correct solution. In fact, after letting the students play for a while, we showed them that the only way to know the real phylogenetic tree was to use the DNA sequences. Then we had a few more slides explaining how mutations in DNA sequences can be used to reconstruct the history of changes in evolution. To make things a bit more entertaining, we also connected a Wii remote to the computer, so the student who played the game had to use it as a mouse. This was fun to set up, and I think I will use a Wii remote in my next talk :-). The activity was a bit condensed in 15 minutes, but I think that more or less all the students understood the basic concept. At least, some made questions, and in general, they seemed to like the game. I hope they will at least remember that DNA can be used to study how species have evolved :-). This year I will teach in a two-week Introductory course to Programming and Bioinformatics, aimed at PhD students and Post-Docs working in Evolutionary Biology. This is a course designed for researchers that have little or no experience with programming, and it will teach them the basics of Bash, Perl, R Programming along with popular tools used in Evolutionary Biology. We tried to keep the cost of the course as low as possible, and thanks to a contribution from the Volkswagen foundation we have been able to keep it at only 300 euros for person. Plus, we have some fellowships available. Today and tomorrow I will be attending a symposium organized here in Barcelona, about bioinformatics analysis of molecular sequences. Many well known bioinformaticians will participate, including Temple Smith (the Smith & Waterman algorithm), Amos Baroch from Expasy and Tim Hubbard from the EBI institute. Check the programme here, or the Streaming Video here. The organization of this Symposium as been innovative in a “web 2.0 way”, as the participants have been able to interact in advance with the speakers, through a online web forum. For example, we have been able to propose to Tim Hubbard to explain how the concept of reference genome will evolve in the 1000genomes era, and, seeing that he has changed the title of his presentation, it seems that he is going to talk about it. So, if everything goes well, I will be twitting from there… This is the first time I use twitter during a conference, so be kind with me :-). The Scifund initiative has reached its final phase. Now all the projects are publicly visible online on RocketHub. I am surprised to see how many projects have been presented! The crowd-funding seems to be a good idea to make science, specially in these times of crisis. I will keep it in mind for when I will finish my PhD and start looking for a post-doc. If I won’t find any position soon, it seems to be a good way to obtain funding for a short research project, and survive a bit more :-). metaphors in science: how to use metaphors to describe complex scientific things to common people. For example, an electrophoresis can be explained as a thin forest that small and big animals have to cross. The Parque Recerca Biomedica Barcelona (PRBB) is the building where I work. It is a big research center built about 5 years ago, hosting about 2000 scientists working on different fields and of different nationalities. If you work in the PRBB, you can check this blog to know what is going on, and whether some of the programming related activities may interest you. If you live in Barcelona, you can still check it out, because most of these activities are open to the public. Even if you don’t live in Catalunya, that blog may still be interesting for you, as it is a way to have an ‘inside view’ of what we do here and what tools and programming languages we use. It may also give you some inspiration on the kind of activities that interest a group of bioinformaticians in a big research center, and can be helpful if you want to emulate the initiative :-). Today, bitbucket has enabled support for git repositories!! This means that, with a little hack and thanks to the sparkleshare project, we can make a home-made dropbox without limits of disk space. Bitbucket is a repository hosting service, like github, sourceforge, and many others. The good thing about bitbucket is that there are no limits of space and private repositories. I use it for almost all my personal projects and for backups. Sparkleshare is a free software designed to automatically syncronize a folder on a remote git repository. In principle, you can choose one or multiple folders in your filesystem, and sparkleshare will automatically syncronize it to a remote repository, such as one on github, bitbucket or another server. Every time you will move or change a file, Sparkleshare will automatically create a commit and push it to the remote server. In short, it is like Dropbox, but it can be used on multiple folders, and you have to find the remote repository to host the files. I had difficulties to configure sparkleshare to work directly with bitbucket, so I have created a repo on github first and then changed the url in the config file. Having a limitless home-made dropbox is cool; however, there are many reasons why I don’t recommend you to abuse this system. First of all, git is slow when handling big files. If you try to syncronize big files such as movies etc (please do not use this for illegal stuff), you will waste a lot of bandwidth, and the syncronization will be very slow. dropbox is free and gives you 2 GB, plus 250 MB for each invitation (note: this link is an invitation, if you register through it, you and I will get 250 MB extra). Ubuntu One already gives you 5 GB for free, and is great at syncronizing preferences and configurations. Now they have also created a Windows client, so there is no excuse to not use it. I only wish that they will fix the http proxy issue soon. Minus.com gives you up to 10 GB of remote file storage, although it doesn’t get syncronized automatically as the other systems (note: this link is an invitation, if you register through it, you and I will get 1 GB extra). #Scifund is an experiment of ‘crowfunding’ for researchers. The idea behind #Scifund is to push scientists toward the world of crowfunding, to teach them how they can propose their research projects on a crowfunding website, and get people to contribute by helping funding them. So, today #Scifund starts its first iteration. If you have an idea about a research project and you think that you can convince other people to fund it, you have about two weeks to prepare a draft proposal and post it to the #Scifund site. If you need more information, I suggest you to sign to their website and their mailing list. It is important to note that the funding will not be collected on their website, but on a popular crowfunding website, RocketHub. The scope of #Scifund is not to do the collect the funding there, but to help researchers to prepare their applications to other crowfunding websites. #Scifund will be a web 2.0 website where researchers will compile applications in a online collaborative manner. Personally, I think that crowfunding is a good idea for research. Of course, they won’t never be able to get the 70 millions dollars needed to test a new antibiotics, or the money needed to support a wet laboratory; but it may be a good resource for bioinformatics. Moreover, even though you are not interested in submitting a research proposal there, their website is a good resource for learning: have a look at their blog, and at all the useful tips they present.